Hundreds participate in funeral of Rabbi Raziel Shevach, who was murdered Tuesday night near the Havat Gilad farm. The funeral of Rabbi Raziel Shevach, the victim of Tuesday night's shooting attack in Samaria, is currently taking place in Samaria's Havat Gilad. Rabbi Shevach, 35, left behind his wife Yael and six orphans: Renana, 10; Naomi, 8; Miriam, 6; Malka, 5; Ovadia, 3; and Benayahu, 10 months. On Wednesday morning, Yael said, "We decided together with the family to bury my beloved husband Raziel, may G-d avenge his blood, in Havat Gilad, where he worked." "Raziel had asked to be buried in Havat Gilad if anything happened to him. We will honor his request and will bury him in the town he loved so much and did so much for. Agriculture Minister Uri Ariel (Jewish Home) said, "G-d of revenge, we want the Holy One Blessed be He to avenge us. We swear to build the land of Israel, and no one will stop us from redeeming the nation of Israel. We will build, we will plant, and we will have children, and this cannot be stopped. This is something which cannot be stopped; we are emissaries and we will do our best to be faithful emissaries." "I turn to the Prime Minister. We have in our hands the ability to make this happen, we ask that it be done today. We should not have reached this moment, but it has happened, and it obligates all of us - and you as well, Mr. Prime Minister, who leads the State of Israel. We will be comforted with the building of Israel." 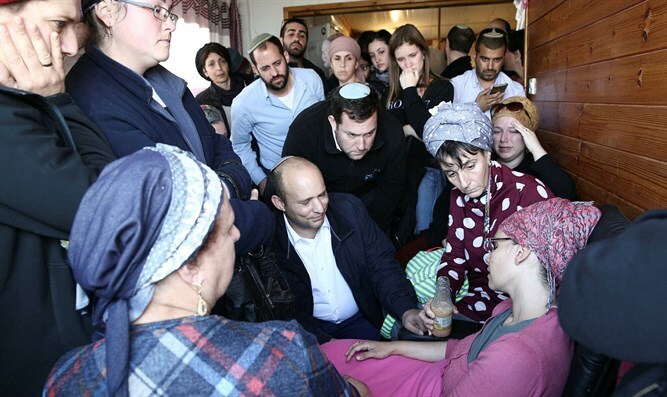 Rabbi Elyakim Levanon, Samaria Chief Rabbi, said, "Mr. Prime Minister, come here and look at the eyes of the children, of the family, of our dear Yael. We cannot continue as usual. We must add light, add Torah, add to the land of Israel. There should not be a court case for every meter [that Jews build]. Instead, we must immediately approve another 100 housing units in Havat Gilad." "So much blessing filled you, so much light. And so much darkness filled those sons of darkness who came to extinguish the light. This time, they succeeded in extinguishing a great light." Samaria Regional Council Head Yossi Dagan said, "Our dear, holy, beloeved brother Rabbi Raziel was a true man of kindness, filled with boundless love. On Hanukkah we stood together, all of us, in the communal house in Havat Gilad, participating in a trivia game you had organized. So much light and happiness flowed from you. You rejoiced with them when they received prizes. You were a man of Torah, and a humble person. As a Magen David Adom volunteer here in Samaria, you saved countless lives. You gave classes, you taught young adults and children." "You are the one who saved so many lives, but lowlifes came yesterday and stole your great soul. Rabbi Raziel did not die of cancer, he did not die or influenza, he was murdered because he was a Jew living in Israel. We look you in the eye, and we promise these murderers that the nation of Israel will never be broken. You, the murderers, believe death to be holy; we make life holy. You consecrate evil, and we consecrate the Torah, the Land of Israel, and the nation of Israel. We will be victorious over you, you band of despicable barbarians. "I call on all members of the Israeli government: We have the best army in the world. We demand that the army bring upon the terrorists a day of revenge and payback. We want to bring back our national honor. Mr. Prime Minister, we insist you announce today recognition of Havat Gilad as a registered town. Mr. Defense Minister, we insist you approve 1000 housing units on this land, here in Havat Gilad. That is what will end the motivation to carry out terror attacks. There is no price for six orphans."